COCOA, Florida -- Camping World, the nation’s largest RV and outdoor retailer, has opened their newest retail location in Cocoa, Florida. 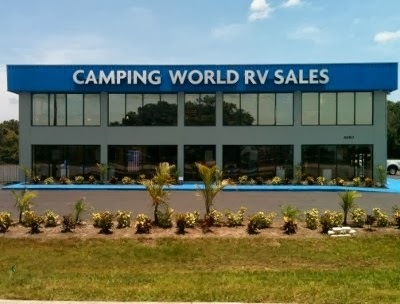 The location is officially named Camping World of Cocoa and offers a wide array of RV sales, service and accessories for the outdoor enthusiast. Camping World of Cocoa is located at 4700 King Street in Cocoa, Florida at exit 201 off I-95. This new 15,000 square foot facility encompasses both a Camping World retail store and Camping World RV Sales dealership. "Our company branching in to the Cocoa, FL market makes perfect sense," said Roger Nuttall, President of Camping World RV Sales. "It is a great place for tourists and visitors to relax and enjoy the atmosphere which makes our new location ideal to serve the needs of outdoor and camping enthusiasts." The grand opening will begin on Wednesday, July 11th with a ribbon cutting by the Cocoa Beach Regional Chamber of Commerce at 9:00 a.m. The celebration will run from July 11 thru July 22. Free lunch will be served Fridays and Saturdays during the event from 11am to 1pm starting July 13. The dealership's operating hours will run from Monday through Friday 9:00 am to 6:00 pm, Saturday 9:00am to 5:00pm and Sunday 11:00 am to 4:00 pm. Customers will find deals on hundreds of new and pre-owned RVs as well as a large product offering of RV supplies and service. The company has employed 25 employees from the local Brevard County area to increase their sales, service, and support needs for this local dealership and accessory store. Nearby Camping World SuperCenter locations include facilities in Winter Garden, Florida and Kissimmee, Florida.